It stood like a sentinel at the entrance, lonely, waiting. I was running late, and yet I slowed the car down, to catch as much of its cool beauty as I could. What was this solitary stranger greeting me at the edge of the John James Audubon Center in Mill Grove, Pa., the epicenter of U.S. birding? It turned out that I was gazing at a ghost. The smooth mass of bronze (photographed at right by Jordan Mann) was a stylized version of a Great Auk—a bird that no longer exists. Four more of its brethren could be spied haunting other areas of the Audubon estate. 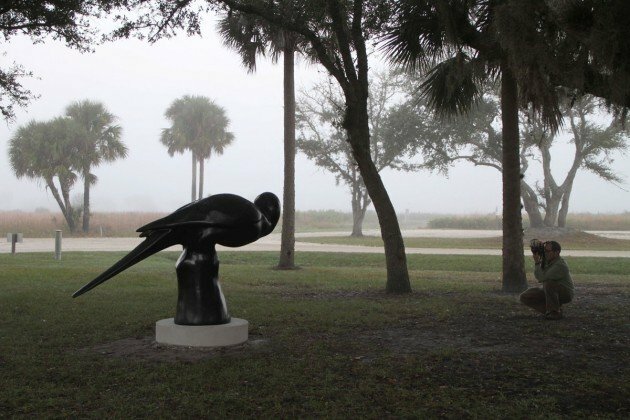 These forlorn figures, I learned, are the work of The Lost Bird Project. Its mission: to educate about the tragedy of extinction by way of evocative, impossible-to-ignore sculptures. The birds on display at Audubon through next April are just one of a number of traveling sets; others can be seen at the Smithsonian Institution in Washington, DC, the Peggy Notebaert Nature Museum in Chicago, the Woodson Art Museum in Wausau, Wisc., and elsewhere. And one set of the sculptures is broken up, scattered. 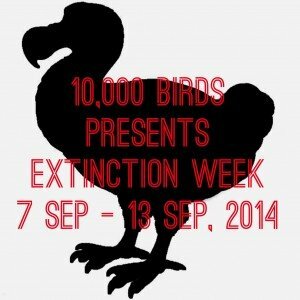 Each bird has been placed at the spot associated with its extinction. Each stands alone as a permanent reminder of what was, and what will never again be. 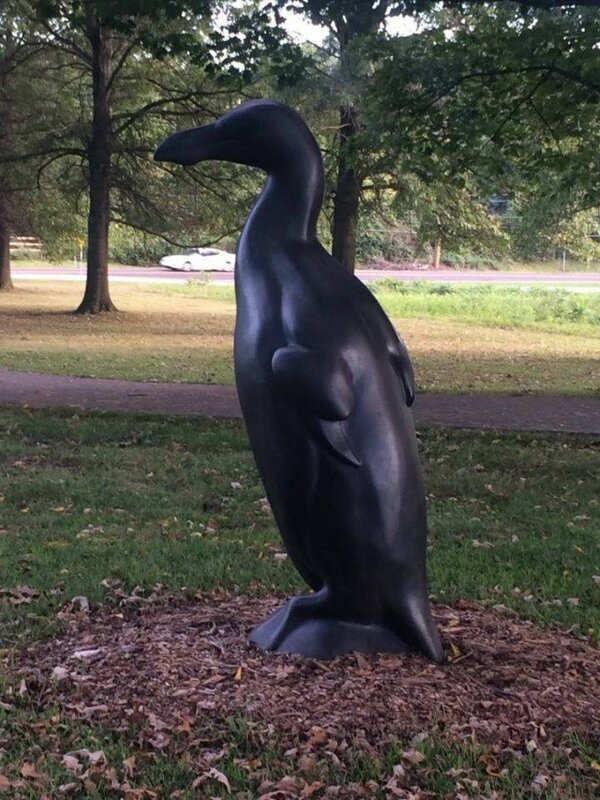 Merely sculpting the bird wasn’t enough to preserve its legacy, according to McGrain: “As I completed the Labrador Duck, it became clear to me that placing it at the site where it was last seen in the wild—at a site so significant to the story of its extinction—was essential to keeping the memory of the bird alive.” The traveling editions, he adds, make the birds and their stories more accessible to people who might not otherwise visit far-flung places like Newfoundland, Canada (Great Auk) or Okeechobee, Fla. (Carolina Parakeet; image above courtesy of The Lost Bird Project). species from the tropics?” In other words “There will be change, but I won’t be affected because a pinch hitter is ready in the bullpen”. The operative word here is “I”. reverent and caring toward the natural world and its creatures. Until we can get the “I” and “my” out of the global warming/extinction debate, nothing is going to change. I’ve been saving my Passenger Pigeon origami paper (enclosed in an issue of the ABA’s Birding magazine). Maybe I’ll fold it today. It is so sad that we have lost these birds, but kinda wonderful that we remember them through art and words. I’ll have to look for those sculptures.